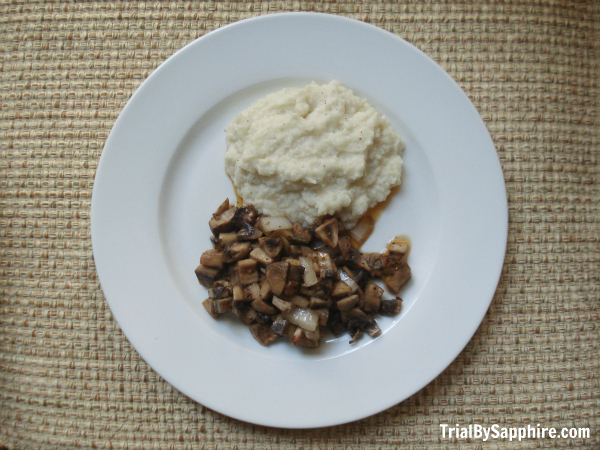 Trial By Sapphire: Recipe: Cauliflower Mashed "Potatoes"
I am never too full to eat fries. I have been known to announce that I'm full at the end of a meal, but if someone offers up the remaining French fries on his plate, consider them inhaled within 2.76 seconds. It wasn't until college that I tried mashed potatoes, and hot damn! I love that too. 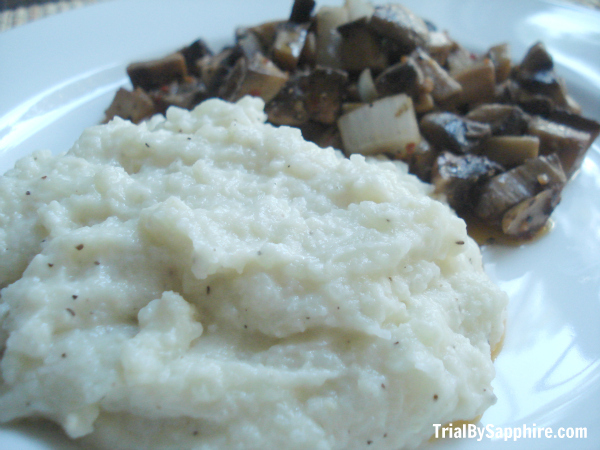 If only mashed potatoes were healthy instead of the starchy carb-monsters that they are. Today's recipe may just change your freakin' life. Mr. TBS makes these cauliflower mashed "potatoes" almost weekly, and to call them a substitute just wouldn't do them justice. They fool my taste buds every time. 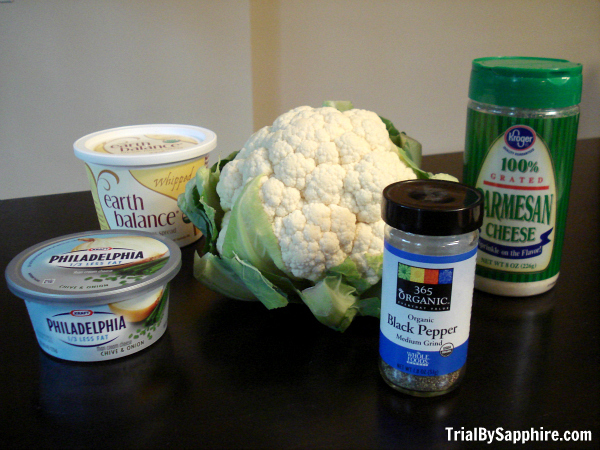 If I knew cauliflower could taste like this, I would have eaten it a long time ago. Cook in boiling water for 5-7 minutes, or until well done. Drain well but do not let cool. In a large bowl, puree all ingredients with an immersion blender (or puree in a food processor). Will you try cauliflower now? I've been really opposed to trying any type of cauliflower based anything on account of its smell, but you've made it look really good (and easy)! If you get a flurry of texts tmrw because I've somehow managed to light my hair on fire while trying this (I've done dumber things), don't be surprised! I've told you this before, Toy makes these cauliflower mashed "potatoes" and OH MY my taste buds love her. I'm the exact same way with french fries. I don't know why, but I can't refuse the pieces of potato goodness. I've seen similar mashed "potato" recipes, but have been hesitant to try. But since you're a fellow potato lover and you say you like them, I may just give them a try! I love califlower mashed potatoes! I have never tried it with cream cheese and parm!! yum! That looks wonderful! I hated cauliflower until I discovered roasting it in the oven. So yummy. You first experienced mashed potatoes in college?! You were missing out during childhood. Even though these do look delicious, I know what cauliflower does to my husband. I would be afraid to be stuck in the house with him if I made these - catch my drift? Is looks delicious, and now I am hungry! Mashed potatoes always make me happy. So so , too good. Lindsay, I was wondering if you accept swaps for your sponsorship! I recently opened my blog up to mine, and I love yours. I would be so excited to work with you! :) let me know! mmmm i totally don;t like cauliflower, but that looks very yummy! WHAT?! I am making this. I just recently fell in love with cauliflower. And I am a mashed potato lover. This is dream food. 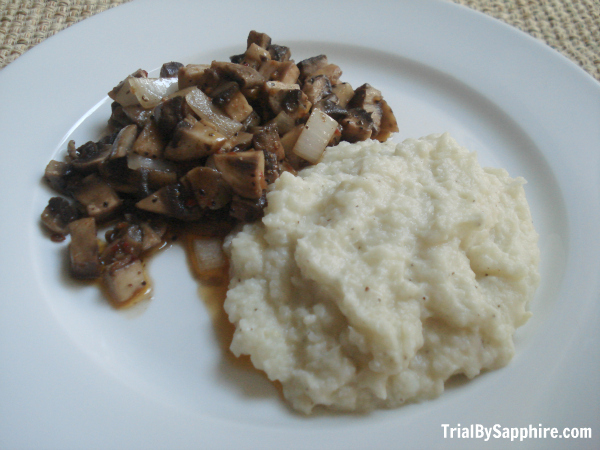 i've always wanted to try this Cauliflower mash thing!! Looks yummy!! That looks sooo yummy!! Gonna try this soon! I'm usually not too big on cauliflower, but this looks really good! Newest follower :) Drop by my blog and say hello! This would be the only way you could tempt me to eat cauliflower. And to be honest, you would have to feed it to me first and tell me what it is only after I've raved about how amazing it is. But this would be a genius way to get kids to eat their veggies. ok. I definitely need to do this.